You control where the Brush tool works by selecting a brush tip of a particular size, shape, and hardness (the fuzziness, or lack thereof, along the edges of a round brush tip). Remember, too, that you can use the Brush and other painting tools to create subtle changes in existing colors. By selecting an appropriate blending mode and opacity, you can mix the painting color into the existing colors in your image. 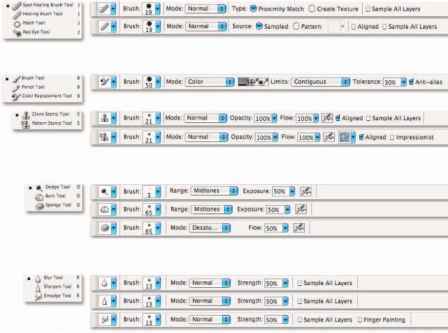 Make these basic decisions from the Options bar, shown for the Brush tool in Figure 14-2. 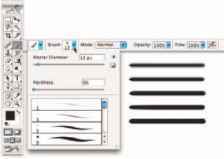 As you see in Figure 14-2, the Options bar gives you access to a mini-Brushes palette, from which you can pick a brush tip, change its size, and adjust the hardness of the brush's edges. (Only round brush tips use the Hardness adjustment.) The five sample lines to the right show Hardness, from 0% to 100% in 25% increments, all using a 13-pixel brush. The Brush tool can use any brush tip that you have in the Brushes palette — and, as you can read later in this chapter, you can customize the brush tip in a variety of ways. Figure 14-2: Make the primary decisions about painting tool behavior from the Options bar. As you work with the brush-using tools, always remember that the selected brush tip is applied as a series of individual impressions, called instances. Consider an instance to be a single impression of the brush tip, like tapping a pen once on a piece of paper — it leaves a single dot. Take a look at the outer borders in Figure 14-3. Changing the brush tip's Spacing value (in the main Brushes palette, found in the Option bar's Palette Well) shows how instances appear. In the upper left, the spacing is set to the default 25% and a continuous line results. To the upper right, Spacing is set to 67%, and the individual brush tip instances are visible as overlapping circles. To the lower left, Spacing is set to 133% — this is a setting that you might use for a dotted or dashed line — and each brush tip instance is visible individually. Figure 14-3: Changing the Spacing makes the individual brush tip instances visible. Here's one other option that you should know about before getting too far into the discussion of painting tools. In Photoshop's PreferencesODisplay & Cursors menu, you have a couple of additional ways to show the cursor when a brush-using tool is active. As in prior versions of Photoshop, you can show the cursor as the active tool (although you can see that already in the Toolbox and the Options bar), as a tiny crosshair (for precision), or in the shape and size of the brush tip. New in Photoshop CS2, you can elect to show the cursor as Full Size Brush Tip, which uses the same shape and size with one difference. When you have a round brush tip with a Hardness setting of less than 100%, this new option uses a circle that encompasses every pixel to be changed. (The now-named Normal Brush Tip trims the circle back to a diameter enclosing pixels that will be most affected by the tool.) Here's one additional change in the Preferences: You now have the Show Crosshairs in Brush Tip check box available that adds the precise cursor's crosshairs in the middle of the Normal Brush Tip and Full Size Brush Tip cursors. Great for painting along edges! If you know you have the cursor set to show the brush tip, but you're seeing the tiny little crosshairs instead, check the Caps Lock key on your keyboard. Caps Lock toggles between precise and brush-size cursors for the brush-using tools. When you change the Brush tool's Opacity setting on the Options bar, you change the appearance of the stroke as a whole. Changing the Flow setting (also on the Options bar), on the other hand, changes the amount of color applied with each instance of the brush tip. When the flow is reduced and the spacing is set to less than 100%, the overlapping area of each brush instance appears darker (or lighter when painting with, for example, white on black). Back in Figure 14-3, a Flow of 50% for the stroke with Spacing set to 67% shows as a series of interlocked, overlapping gray circles, darker where they overlap. If, on the other hand, Flow were set to 100% and Opacity were set to 50%, you'd see the same stroke as Figure 14-3, just gray rather than black. One last option for the Brush tool deserves a quick look. To the right of the Flow field is the Airbrush button. When the Airbrush is on (the button turns dark), the Flow value takes on more meaning. 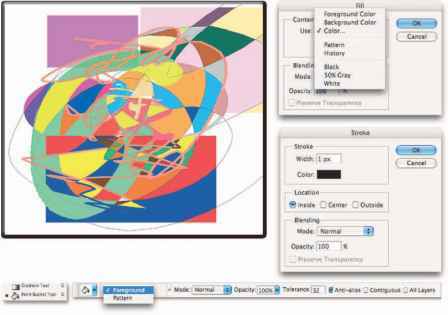 As you paint with the Brush in Airbrush mode with a reduced Flow setting, pausing the cursor with the mouse button down allows color to build up (become more opaque) as if you were using a real airbrush. You can use the Airbrush both as a traditional airbrush artist and to simulate spray paint. You can see both in Figure 14-4. Figure 14-4: Airbrushing and spray painting with the Airbrush option for the Brush tool. The Pencil tool differs from the Brush tool in one major respect: Regardless of the Hardness setting in the Brushes palette, the Pencil tool always uses a hardness value of 100%. With the Pencil tool active, the Options bar offers the mini-Brushes palette, choice of blending mode and opacity, and the somewhat-misnamed Auto Erase option. When selected, Auto Erase lets you paint over areas of the current foreground color using the current background color. Click an area of the foreground color, and the Pencil applies the background color. Click any color other than the foreground color, and the Pencil applies the foreground color. But remember, you're not erasing, just painting with the background color (even on layers with transparency). The third of your primary painting tools is the Eraser. On a layer that supports transparency, the Eraser tool makes the pixels transparent. On a layer named Background, the Eraser paints with the background color. On the Options bar, the Eraser tool offers you the same options as the Brush tool (including Airbrush) and one more important choice: To the right of the Airbrush button, you'll find the Erase to History check box. When selected, the Eraser tool paints over the pixels like the History Brush (see the sidebar "Selective Undo: The History Brush"), restoring the pixels to their appearance at the selected state in the History palette. You have a couple of variations on the Eraser tool tucked away with it in the Toolbox, too. The Background Eraser tool can, in fact, be used to remove a background from your image. However, it's not limited to something in your image that appears to be a background. Remember that digital images don't really have backgrounds and foregrounds or subjects — they just have collections of tiny, colored squares. What does this mean for using the Background Eraser? You can click and drag on any color in the image to erase areas of that color. You can also elect to erase only the current background color and designate the foreground color as protected so that it won't be erased even if you drag over it. The Magic Eraser, like the Magic Wand selection tool (see Chapter 8), isn't a brush-using tool, but this is a logical place to tell you about it. Click a color with the Magic Eraser tool, and that color is erased, either in a contiguous area or throughout the image. And, like the Magic Wand, you can set the tool to work on the active layer or all layers, and you can also set a specific level of sensitivity (Tolerance). Here is the one difference between the two: The Magic Eraser is, in fact, a painting tool in that you can set an opacity percentage, which partially erases the selected pixels. i Click a saved color swatch in the Swatches palette. i Enter numeric values or drag sliders in the Color palette. i Click a color swatch at the bottom of the Toolbox or in the Color palette to open the Color Picker. i Select the Eyedropper tool and click any color already in your image. Heck, click in your image with the Eyedropper tool, hold the mouse button down, and drag to any color anywhere on your screen — that color doesn't even have to be in Photoshop! Ctrl+Z (Windows), you reverse everything you've just done. In contrast, Photoshop's History Brush lets you paint back areas of your image to a prior state, leaving the rest of the image just as it is. 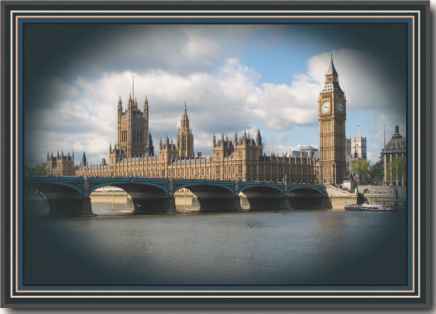 For example, you can help the subject of an image stand out by blurring the background. One of the simplest of the many ways to do this is to blur the whole image and then paint back the subject with the History Brush. In the figure here, you see the original, all-sharp image in the upper left. Below that is the image after applying a two-pixel Gaussian Blur (about which you can read in Chapter 15). To the right, I use the History Brush to paint back the original sharp version of the image for the primary bloom, leaving the rest of the image blurred. carded when the image is closed, whether you save it or not. If you get a message that the History Brush is not available, take a look at the History palette. Did you crop the image or use the Image Size command? Any change in the actual pixel dimensions of the image invalidates any prior history states for the History Brush. No worries! Simply select a snapshot or history state in the palette that comes after the change in image size. In both the Toolbox and the Color palette, the foreground color is shown in the swatch to the upper left, and the background swatch is partially hidden behind it. Swap the foreground and background colors by pressing the X key on your keyboard. Reset them to the default black and white by pressing the D key. In Chapter 6, I introduce the Color palette and the various ways you can define color with it. Now take a look at the Color palette's big brother, the Color Picker (see Figure 14-5). The best way to get a feel for the incredible versatility of the Color Picker is to open it (click a color swatch at the bottom of the Toolbox or in the Color palette) and click each of the buttons to the left of the numeric fields. 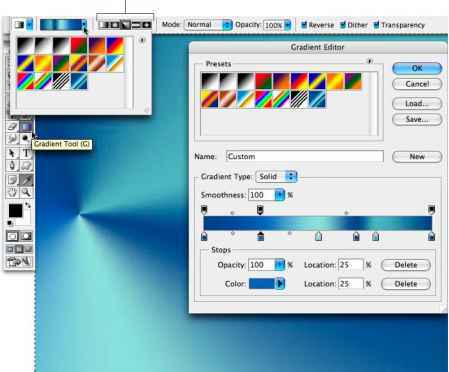 Each option changes how the Color Picker appears as well as how it defines color. Figure 14-5: Use Photoshop's Color Picker to define colors with precision. Between the two color swatches in the top center and the buttons to the right are a pair of little icons that are not always visible. (You can see them in Figure 14-5 if they're not currently showing in your Color Picker.) The top warning triangle tells you that the current color can't be reproduced within your working CMYK color profile. Unless you're preparing artwork for commercial offset press, ignore it — it has nothing to do with your inkjet printer, for example. If, on the other hand, you are working on a press-destined project, click the swatch just below the warning triangle to jump to the nearest reproducible color. Also note the Color Libraries button, known in previous versions of Photoshop as the Custom button. Clicking that button swaps the Color Picker for the Color Libraries dialog box (as shown in Figure 14-6), in which you can select spot colors. Spot colors, which I explain in Chapter 6, are special pre-mixed inks that can be specially requested when preparing a job for a commercial printing press. Adding a spot color ensures that the color will appear in the final product exactly as expected. 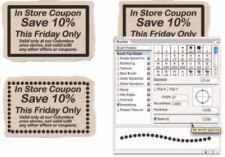 However, because they generally require an extra pass through a press, adding spot colors increases the cost of your printing. Spot colors can be used to define colors for nonpress jobs, but the color is converted to your working color mode and printed with a mixture of your regular inks. Return to the Color Picker from Color Libraries by clicking the Picker button. Figure 14-6: Choose custom spot colors in Color Libraries. Photoshop has a double handful of additional tools that use brushes and the Brushes palette to make changes to your images. You can see the tools and their Options bar offerings in Figure 14-7. Figure 14-7: Photoshop has almost a dozen additional brush-using tools. i Color and clone tools: The Color Replacement tool (now nested with the Brush and Pencil tools rather than the Healing Brush and Patch tools) replaces the color over which you drag with the foreground color. Remember that the Color Replacement tool alters only the color, not luminosity, so painting with black over pink gives you gray rather than black. From the Options bar, you can set the tool to change luminosity rather than color to darken or lighten, or choose to match hue or saturation. 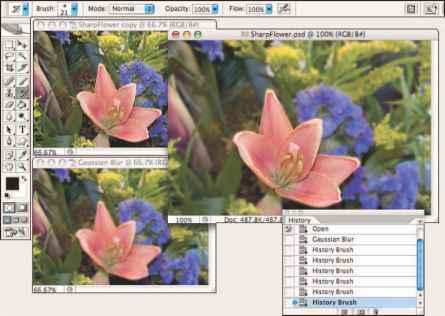 The Clone Stamp tool, unlike the Color Replacement tool or the Healing Brush, doesn't copy an attribute (such as color or texture) but actually copies pixels. It's like having copy/paste in a brush. Option/Alt-click a source area and then drag where you want to copy those pixels. Powerful! The Pattern Stamp tool paints with a selected pattern, using the blending mode and opacity that you designate in the Options bar. The Pattern Stamp tool is sometimes a good way to add texture selectively. You have several more ways to add color to your artwork, all techniques that don't use brushes at all. You can, for example, make a selection and fill the selection with color via the EditOFill command, or you can add a band of color along the edge of the selection with the EditOStroke command (using the dialog boxes shown to the right in Figure 14-8). You can also "dump" color into your image with the Paint Bucket tool (nested below the Gradient tool in the Toolbox). Use the Paint Bucket to fill an empty selection with color or to replace the color on which you click with the foreground color. Figure 14-8: Photoshop offers several non-brush ways to add color to your images. Unless you make a selection first, the gradient fills your entire layer. If you want the gradient to fill the entire layer, don't make a selection first. 2. Select the Gradient tool. Click the Gradient tool in the Toolbox. If you don't see it, look for it nested with the Paint Bucket tool. You can open the Gradient palette by clicking the triangle to the right of the sample gradient on the Options bar (see Figure 14-9). You can also click the sample gradient directly to open the Gradient Editor. You can pick a blending mode and opacity, flip the colors in the gradient with the Reverse option, choose Dither to help disguise the transitions between colors, and mark the Transparency check box to preserve any transparent areas on your layer. 6. Drag the Gradient tool. Where you start and in which direction you drag ultimately determine the appearance of the gradient. Figure 14-9: Control gradients with the Options bar, Gradient palette, and Gradient Editor. Click anywhere along the top (opacity) or bottom (color) of the gradient to add a new stop. Drag stops to move them. Option/Alt-drag a stop to duplicate it. Change the attributes of the selected stop with the options just below in the Gradient Editor. After designing your new gradient, remember to click the New button to add it to the Gradient palette. But keep in mind that custom gradients aren't really saved until you use the Save button or the Preset Manager to create sets on your hard drive. If you don't save your custom gradients, they'll be gone if you need to reset Photoshop's Preferences file (see Chapter 3).